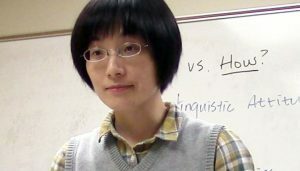 Yi-Ju Lai, a Ph.D. candidate in Second Language Education program in the Department of Curriculum and Instruction, was recently selected as one of two graduate student board members of the prestigious, international journal TESOL Quarterly. The journal connects theory with practice and addresses the practical concerns in the fields of language acquisition and applied linguistics. As a board member, Lai will review manuscripts, evaluate proposals for the special issue, and participate in the editorial board meeting at the TESOL convention for a three-to-five year term. Lai’s current dissertation project is in the field of applied linguistics. She examines the language socialization of multilingual international teaching assistants and their American students . Her advisor is Professor Kendall King, who supported her TESOL board application along with Professor Cynthia Lewis. Learn more about the Ph.D. program in Second Language Education and see examples of student research.